Archive of 2000 PNC Info. As articles age, the possibilities increase that the links below may no longer work, especially those to sites other than ours. 12/15/00 - The USPS issued two rate-change coils today in three formats: A Water-Activated Statue of Liberty Non-denominated coil of 3000 with plate # 1111, A Self-Adhesive Statue of Liberty coil of 100 with plate # 1111, and a Flower (4 Designs) coil of 100 with plate # B1111. The Water-activated coil has been found in Tucson, AZ, Providence, RI, and Philadelphia, PA. The PSA Liberty has been located in Tucson, AZ, Providence, RI, Cincinnati, OH, Philadelphia, PA, and Lexington, KY. The PSA Flowers turned up in Tucson, AZ, Providence, RI, Detroit, MI, Cincinnati, OH, Philadelphia, PA, Lexington, KY and several spots in California. I would expect that the PSA coils should be available almost everywhere. 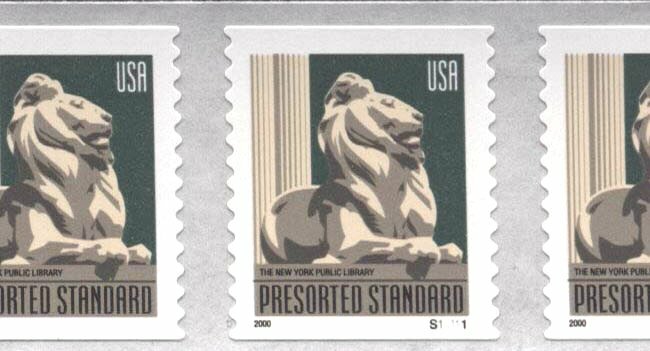 11/22/00 - The USPS issued the Presorted Standard Non-Denominated 10� New York Public Library Lion Stamp on November 9, 2000 in New York City. The stamp is different from the pre-release version that we pictured on June 6. The issued stamp has the wording "The New York Public Library" added to the design. So far, I know of three offices that have these available: Tucson, AZ, Providence, RI and The St. Matthews Branch in Louisville, KY.
11/22/00 The Postal Service has just announced that on Dec. 15 two non-denominated coils will be issued in rolls of 100. These stamps will later appear as denominated stamps. A Flowers coil (showing four designs, one for each flower) will be printed by Guilford Gravure and will carry a "B" prefix and four digits showing that the contract was held by Banknote Crop. of America. A Statue of Liberty coil will have four digits, 1111, and no prefix. It was printed by the Bureau of Engraving and Printing. "As the month of October passed without the delivery of the long-awaited PNC catalog, Rich Nazar communicated with me to inform me that he has missed another deadline. This is indeed unfortunate news. Rich is unwilling to say when he will be able to deliver it. He is still working to complete it, and will eventually begin shipments. Given the history here, it's not hard to understand why he refuses to name a date, however. "At this point, we have decided that anyone who has placed an order for a catalog and wishes a refund should request it from Tom McFarland. Many members have inquired during the past few months, and it is only right that they should once again have use of their funds. "Some members, myself included, may wish to leave their funds with the club in anticipation of the eventual delivery of Rich's product. This course of (in)action will not affect my cash flow, and it's certainly less work for our Treasurer. We will retain the orders if members wish us to do so. "Members requesting a refund at this time will need to order the catalog on the open market at market price when it eventually becomes available. Rich has stated that it is not his intention to raise the price to members who have already ordered from the club, but he makes no guarantees. Depending on the price of paper at the time of publication, an increase may be needed. "A dues renewal form is found elsewhere in this issue [note: the December issue of Coil Line]. For those who have ordered a catalog, want a refund, and wish to have their refund applied to next year's dues, they may so indicate on the renewal form, and Tom will send a refund check in the amount of the difference." 11/07/00 - Donna Rajotte, the Internet Philatelic Clerk at Providence, RI sent a note that she has the new 10� NYC Lions stamp in stock. Her supply has plate #S11111 every 21 stamps and has pink back numbers every 10 stamps. Top and bottom back numbers are available. 210 stamps are needed for a # on # hit. These are from a 10K coil. 11/01/00 - Donna Rajotte, the Internet Philatelic Clerk at Providence, RI has coils of 100 of the 33� City Flag coil with plate combination 2222B. 10/12/00 - John Larson has updated his information for the next Durland Catalog with information current to October 8, 2000. Access the data by clicking on the 2000 link or go to the box near the bottom of the page. (The link is in FTP format). 09/29/00 - GOOD NEWS!! - The issue of Linn's Stamps News dated October 9, 2000 WILL carry the "U.S. PNC Stamp Values", commonly know as 'Linn's Trends'. This information has been delayed several times and it finally is being published. Thanks to Linns and Dave Cockrill, who gathered and compiled the data. 09/28/00 - The 33� City Flag with a new suffix of 'B' is being circulated. The coil is probably a PSA 100 and the number is 1111B. 09/27/00 - Used singles on cover of the 33� City Flag coil stamp with plate combination 8888A have been found mailed from Plymouth, PA, while number 9999A has been reported on mail from Anchorage, AK. 09/22/00 - A member reports the following available as of 9/20 at the Minneapolis Philatelic Store. 10� Canal Boat #5, 33c City Flag #1111, 3433, 9999, 1111A, 4444A and 6666A. 09/17/00 - Another new number of the PSA 100 33� City Flag has been confirmed. #9999A has been located in Southern California and Central New Jersey. 09/15/00 - For an update on the Nazar PNC Catalog from John Cropper, please click on the Nazar link. 08/30/00 - Another new number of the PSA 100 33� City Flag has been confirmed. #8888A is out there somewhere. 08/20/00 - Another new number of the PSA 100 33� City Flag is now in circulation. #7777A is available and on sale at the Providence, RI Philatelic office. 08/18/00 - A member reports that City Flag #6666A was seen on a cover mailed in Tempe, AZ and that water-activated #3333 was found on an envelope postmarked Louisville, KY..
07/09/00 - From an ad in Linn's, we find that the 33� City Flag Gummed Coil is now available with plate #3333. This coil, probably 10,000, has back numbers top and bottom. 06/29/00 - The July Issue of Coil Line includes a letter from Richard Nazar concerning the next edition of the Plate Number Catalog. Clinking on the link will take you to a copy of the letter. It is a large file and may take a while to load. 06/25/00 - A report of new locations on the PSA 100 33c City Flag. 4444A was found on covers mailed in Denver, CO, NY, NY and Brooklyn, NY (Not Buffalo as stated earlier). 06/24/00 - As reported in this space on June 4, another new number of the PSA 100 33� City Flag is now in circulation. #5555A is available and on sale at the Providence, RI Philatelic office..
06/12/00 - Word from a knowledgeable source indicates that the scheduled publication date of the PNC Trends in Linn's has been rescheduled. The listing is now to be printed in the issue of Linn's that will be distributed at the APS Annual Show in Providence in August. 06/11/00 - A report of a new location on the PSA 100 33� City Flag. 4444A is available at the philatelic office in Santa Ana, CA. 06/6/00 - The Virtual Stamp Club on Delphi reports that the USPS will issue a stamp in November to replace the 10� Presorted Standard Bicycle. The stamp will feature one of the Lions in front of the New York City Public Library on 34th St. The Lion coil will probably be issued November 9th as part of the New York Mega Show. 06/5/00 - Reports of new finds on the PSA 100 33c City Flag include 3333A in Richmond, KY and Florida, plus 4444A in Auburndale, WI. 06/4/00 - Two new numbers on the PSA 100 33� City Flag have been reported by two different people who took the BEP tour at NAPEX. 5555A was on the presses and a spokesperson reported that plates had been made for 6666A. 06/1/00 - The new plate number catalog that was promised sometime in May has not yet been delivered to subscribers. No word on when it will surface. 05/21/00 - Another new number has been found on the PSA 100 33� City Flag. Add #4444A to the list. 05/20/00 - A recent issue of Linn's announced the discontinuance of the Trends listings except for a selected few. Be advised that the Trends for Plate Number Coils will be in the issue dated July 6, 2000. 05/1/00 - The May 2000 issue of Coil Line, our monthly journal, carries an article stating that the first section of Rich Nazar's PNC Catalog should start showing up in mailboxes this month for those who have placed an order. 04/30/00 - Supplies of the 33� City Flag Coil with the "A" suffix are showing up around the country. Those places reported so far are: 1111A in Providence, RI, Southern New Jersey and Richmond, IN; 2222A near Tucson, AZ and Auburndale, WI; 3333A in Cincinnati, OH and Auburndale, WI. All three number combinations were found in a single order from the same bubble flat in a shipment from the caves in Kansas City, MO. 33c City Flag. 04/3/00 - The United States Postal Service announced that it plans to issue on June 16, a linerless self-adhesive coil of 100 which will feature the 33� Fruit Berries Design. More details as they become available. 04/1/00 - Another new number has been found on the PSA 100 33� City Flag. Add #3333A to the list. 03/25/00 - The February 2000 issue of Coil Line, our monthly newsletter, carried an article from the President, Gene Trinks, offering a premium for new members. For the first 100 new PNC3 members, the new member may order $25 in face value of all different PNC strips of 5 for only $25. This generous offer is from one of our member-dealers and is still valid. If you are not a member and wish to take advantage of this offer, go to the application form and fill it in, print out a copy and mail your remittance to our Treasurer, Tom McFarland, whose address is on the form. 03/15/00 - I have fixed a 'bug' in the Membership Application which prevented the information from being transmitted to the club and also acknowledged that the form was sent. 03/14/00 - Plate #1141 on the 'H' rate coil, Scott 3265, has been ruled "genuine in all respects" by the American Philatelic Society Expertising Service. Dan Farrar originally shared his find of this number with other members at the Annual Meeting during Stampshow last August in Cleveland, Ohio. His copy is the only one that has ever surfaced and was postmarked in Cleveland on March 16, 1999. Are there others hiding out there? Just for information purposes, several noted PNC specialists have questioned the opinion of the experts at the APS. 03/13/00 - *** Major Upgrade Done *** I have completed both the Denomination and Numerical listings adding a Characteristics column to the PNC listings. In addition, the non-graphic printing options are finished. I've added listings for Imperf coils and Scott listed varieties and tried to add enough of a description in a few words to differentiate between like stamps. Please note that because of all the added information, I had to break both the numerical and denomination listings into two files, and you will need to print out both files. You can reach the printing options on the master page from the above link. 03/12/00 - Another new number has been found on the PSA 100 33� City Flag. Add #2222A to the list. 02/26/00 - We have added another dealer, The Coil Corner, to our page devoted to PNC3 member dealers. Access his site from the link in the box down below entitled PNC3 Dealers. If you are a member dealer and have a web site, let me know and I'll provide a link. We would also appreciate a reciprocal link on your site. 02/24/00 - The Self-Adhesive Bicycle (Scott #3228) with plate #666 is available from Donna Rajotte, the Internet philatelic clerk at Providence, RI. Donna reports that she now has plate #666 with both Top and Bottom back numbers - 420 stamps needed for a # on # hit on either one. 02/16/00 - Scott #2257b, the 10� Canal Boat has been confirmed with a dull (semi-gloss) gum printed from plate #5. The stamp uses Prephosphored uncoated paper (mottled tagging) and was found on coils of 10,000. 02/15/00 - Now we know how the plate sequence will appear following the #9999 on the PSA 100 33� City Flag. Donna Rajotte, the Internet clerk at Providence, RI. reports that she has the 33� City Flag PSA in coils of 100 with plate #1111A. 02/12/00 - The Self-Adhesive Bicycle (Scott #3228) with plate #344 is available from Donna Rajotte, the Internet clerk at Providence, RI. She reports that she has plate #344 with both Top and Bottom back numbers - 420 needed for a # on # hit on each. 02/11/00 - In addition to the report, now confirmed, of the (25�) S/A Diner, (SC#3208A) with plate #33333, a major PNC dealer also reports the existence of plate #44444. 02/08/00 - Donna Rajotte, the Internet philatelic clerk in Providence, RI sent her coil list and we have it online. Click on the link HERE to go to the listing. It's not pretty, but the info is there. 02/07/00 - Word from Donna Rajotte in Providence, RI that Kevin Rich will be the back-up philatelic clerk. He has Bob Starkey's old job. Donna will continue to handle the mail order and internet sales the same as Bob did when he could no longer work the window. She will be returning to her own hours and days off - 3:00 to 11:30 pm Mon.,Thurs.,and Fri.: 10:30 am to 7:00pm Saturday and Sunday. A big welcome to Kevin. 02/07/00 - The Self-Adhesive Bicycle (SC#3228) with plate #666 is available from Donna Rajotte, the philatelic clerk at Providence, RI. She reports that she has plate #666 with Bottom back numbers - 420 needed for a # on # hit. 02/05/00 - A collector reported getting a commercial cover of the S/A Diner, (SC#3208A) with plate #33333. Keep on the lookout for this new number and let us know where it can be purchased. I will not list this number until it is confirmed. 01/11/00 - A new (not so new) item has surfaced. The City Flag water-activated coil of 100 (Scott #3280) with plate combination 2222 has been reissued in rolls of 3000. Apparently the only difference is that the new format has back numbers. The last coil of 3000 with plate 1111 had blue back numbers (assuming this is a BEP printing) both top and bottom every 20 stamps. The plate number interval was 24 stamps. 01/10/00 - Scott# 2252, the 3� Conestoga Wagon has been found with a dull (lo-gloss) gum on plate #5. This plate number previously was released using a shiny gum. 01/02/00 - A new page is 'finally' being added. Down near the bottom of the page in the 'Useful Sources of Information' box is the link to our member dealers. It's not pretty and it's only a start, but we have one dealer listed.